So who are The Breath Company? 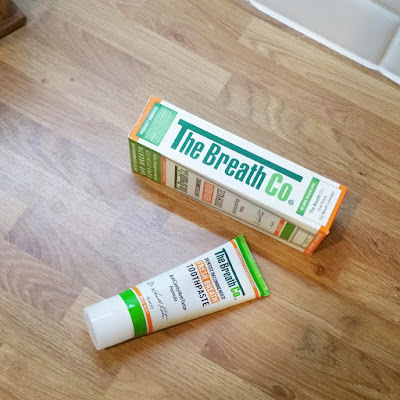 The Breathe Co was created by Dr Harold Katz, after his daughter was bullied at school over her bad breath. He decided to take a new approach to cleaner teeth and fresher breath by using the natural power of oxygen to attack hostile germs that live inside the mouth. Fresh Breath Toothpaste This toothpaste is clear in appearance and contains no artificial flavouring or colouring and the packaging states that it "helps fight against bad breath, dry mouth and maintains healthy gums". Like any toothpaste it recommends brushing at least twice daily. The first thing you will notice is that the toothpaste has no taste and does not foam up at all which I was not used to. I did notice that my teeth felt smooth and even though I didn't have that after brush minty taste that the everyday brands offer, I did feel that my breath was fresh. The Breath Co Fresh Breath Oral Rinse This oral rinse uses the natural oxygenating power of OXYD-8 to destroy the bacteria that cause bad breath odour including Morning Breath and eliminates sour, bitter and metallic tastes in your mouth. It contains no alcohol no artificial flavours or colours., which is said can act as a drying agent. 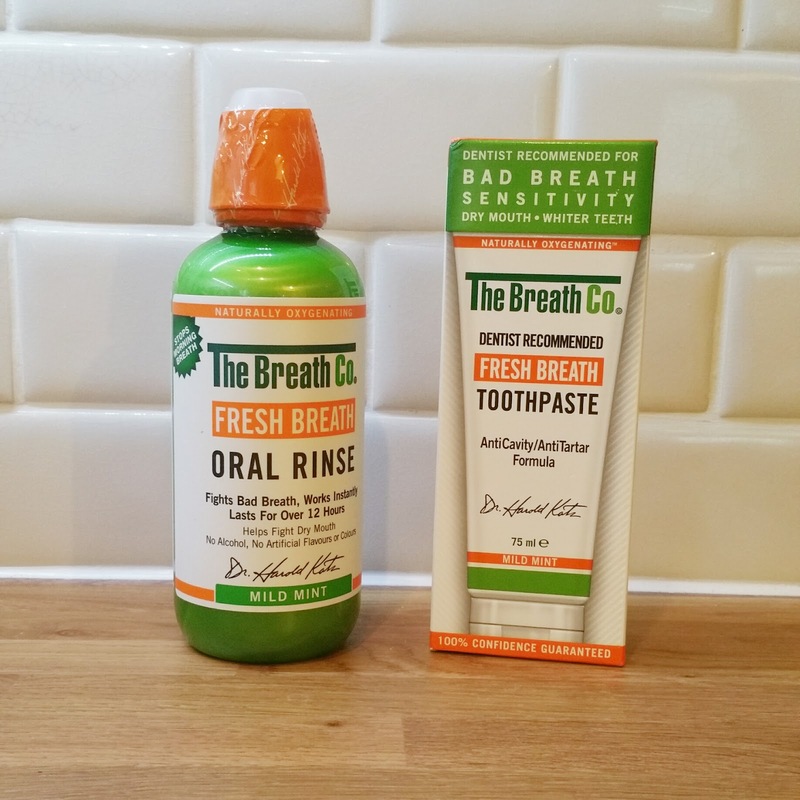 An additional point that The Breath Co production offer is that both the mouthwash and the toothpaste are suitable for vegetarian, vegans, are kosher and gluten-free and approved for diabetics. I personally felt that the products did produce a normal breath, and no one was pulling away from me when I was talking up close and personal! 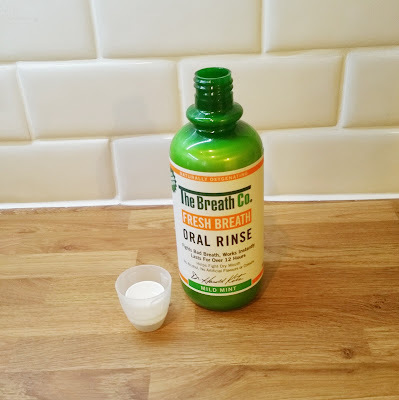 The only negative thing I can say about this oral rinse was it didn't leave me with that usual minty after taste,and some people may find that preferable. However, they do sell a Icy mint version which I would chose next time just too reassure me!. Let's not pretend, The Breath Co are expensive but offer very good products which deserve their price tags and anything that can provide fresh breath confidence is worth the money. You can buy The Breath Co products from Boots, Superdrug, Amazon and a few selective Pharmacies. This does sound interesting. I like the fact there's no alcohol in the rinse as well as I've heard that's not good if you use them daily. Not familiar with the company but I know bad breath is not attractive, thanks for the honest review. I've never heard of the breath company before!! This is right up my street because I can't use mouth wash that has alcohol in, it makes my throat really sore and uncomfortable. After many trips to the doctors, we realised it was the mouth wash! Sure enough, I stopped using it and throat problem stopped. I will be checking out these products. Thank you so much for sharing.